This guitar lesson is all about developing your picking hand. Building your picking chops. This is a guitar picking exercise that I wrote to help me warm up my own right hand. Before we jump into the main picking exercises for guitar, here are a couple of things that you may want to put into your practice routine. Try playing scales with various rhythms. So for instance you may want to play a scale picking 2 times (down then up) on every note using 8th notes. That’s 2 times in a beat. Then play 3 times on every note playing 8th note triplets. That’s 3 times in a beat. Again keep a strict down up picking going. And finally playing 4 times on every note using 16th notes. That’s 4 times in a beat. It’s good to practice with a metronome to help you learn to keep a steady time. Using a metronome also helps you keep track of your progress in developing speed. Alright, now the main event. This is my picking warm up exercise. There are a couple of little twists in this to give your picking hand a challenge. The exercise plays one time through using 8th note triplets, and then one time through with 16th notes. It also is made up of a measure of 5/4 time followed by a measure of 4/4 time. So that extra beat in the 1st measure gives an extra twist to the 8th note triplet section. Because there are a total of 9 beats in the exercise before repeating…when using 8th note triplets the 2nd time through your picking will be exactly opposite as the first time you play it. This can be a challenge at first, and you may want to build it up slowly by getting comfortable with small sections, and then try adding 3 notes more at a time until you can play the whole 9 beats with strict alternate picking. …and here is the picking the 2nd time. Exactly opposite as the first time. For the 16th note section, the picking is faster. So depending on the speed you are playing your picking hand may get a little more tired than in the 8th note triplet section. But the picking is actually easier because you always start each new note with a down pick. And just pick down up down up for each new note. You will play 2 times through with 16th notes, and then go back to the 8th note triplets. Since the 8th note triplets are a little slower, it gives your muscles a little rest before you go back to the 16th notes again. So you switch between more picking direction challenges with the 8th note triplets, and pushing your muscles physically more when playing the 16th notes. So here is the complete picking warm up exercise. 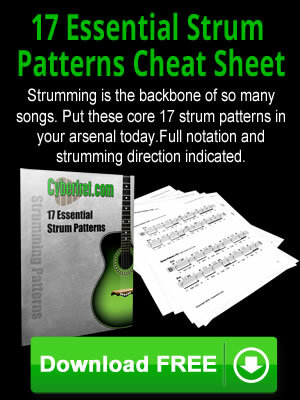 Try practicing it with a metronome, or try playing it with the drum beats below it. Here are 3 drum tracks that you can use to practice the picking exercise with. They are in 4/4 time. So the exercise will be displaced as you are playing a total of 9 beats with the 4/4 drum beat. But every time you go through the entire cycle of playing 2 times with 8th note triplets, and 2 times with the 16th notes….they will line up again on beat 1 of the drum pattern. It’s a polymeter if you want a big fancy word for it. There are 2 time signatures going on at the same time. But unimportant unless you are a prog rocker, the drums are just keeping a steady beat for you. Have fun with your new guitar picking warm up exercise.